Reader JPK couldn't have possibly known, when he commissioned this review by donating to the Carry On Campaign, that Peter Weir is one of my favorite directors - somehow, I've managed to completely avoid mentioning the man in the entire history of this blog. So thanks, JPK, for occasioning the Antagony & Ecstasy debut of one of the most under-appreciated auteurs of contemporary cinema. 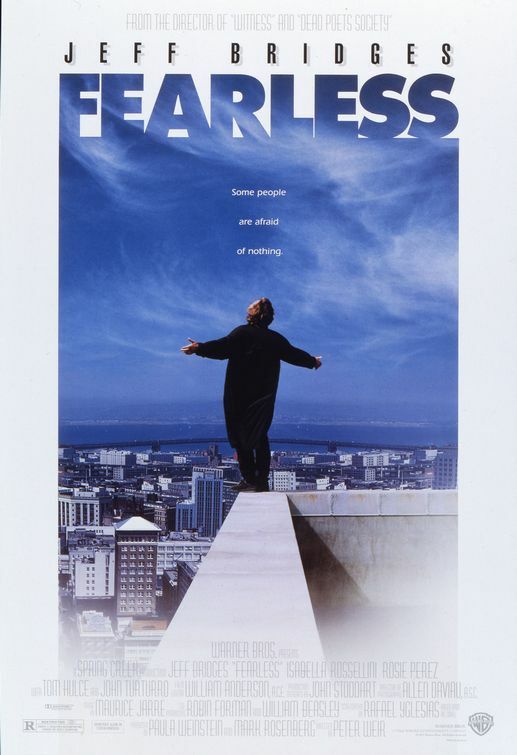 The opening of the 1993 film Fearless is altogether otherworldly - more than a bit appropriate, given what happens over the subsequent two hours. Over the sound of deep, unidentifiable rumbling, a man (Jeff Bridges) carrying a baby leads a boy through a misty, smoky cornfield. A handful of shots; perhaps a minute of film; and it hooks you instantly. Devoid of context - and we lack all context - it could be anything: a war zone, a post-apocalyptic hell, neither of which would be a terrible metaphor for describing the actual fall-out of what proves to be a plane crash, which we lean only when we see just the tail, lying in the middle of a blasted-out patch of torn plants and dirt. It's a bravura start to a bold, challenging movie, not least because the manner in which director Peter Weir deprives us of context is the approximate cinematic equivalent to the experience of stumbling through the aftermath of a crash: what the hell is going on? what's all this smoke? (my immediate first thought, and I don't think it speaks to nothing more than my own biases, was that Weir was deliberately evoking horror movie imagery). What we can't know initially is that the opening also foreshadows thematic and tonal elements that will only be gradually played out as the film progresses: I didn't use "otherworldly" by chance, for the hazy impression of those first few shots ties in neatly to the almost mystic elements found later, a kind of quasi-spiritual rebirth. The opening shots' relationship to one of the very last images in the film - I give away nothing to say that I have in mind a shot of Bridges preparing to exit the fuselage, bathed in blinding daylight - confirms the disorientation of the opening as the representation of a world as new and untested to the protagonist as it is to the audience. Bridges plays Max Klein, a man desperately afraid of flying, who discovered, in the moment that he was certain of his impending death, realised that he no long had fear. Of anything. To put it bluntly, he's convinced that he's invulnerable, and in the process has gone a little odd. The kind of odd that makes him wander away from the crash site with little more than a shrug, the kind of odd that sends him to visit an old friend before he's even called his wife that he's alive (a pointedly weird digression it is, too: and as with all pointedly weird moments in cinema, it's worth pondering why. The simplest explanation, and therefore the likeliest to be true, is that Max, having found himself to be reborn, must return to his youth, symbolically, before he can return to his present). Oddest of all is that Max, deathly allergic to strawberries, nonchalantly orders a bowl full of the fruit at a diner, and when questioned, simply affirms, "I'm past all that". That's the key line in the film, cleverly positioned in a strange throwaway scene so that you can't help but notice its importance, even while you can't possibly guess at its significance yet. Essentially, Fearless is a study of a man who convinces himself that he's "past all that", in the process denuding himself of his humanity - to be fearless, after all, is to deny one of the most essential and primal of human emotions. It is, and explicitly so at points, a story of trauma, and the tendency of people to compound the damage done from traumatic experiences, by trying to find some way to keep that trauma boxed in. As directed by Weir, written by Rafael Yglesias (adapting his own novel), and especially as acted by Jeff Bridges, in one of the best performances of a career laden with outstanding work, Fearless is a bottomless character study of the tormented mind convincing itself of its own robust healthiness; the story of how the re-awakened desire to live can be turned into something alien and selfish. Yet it is not, in the slightest degree, a judgmental film; one that observes with grave concern, but understands that whatever process Max is going through, it is the one that he must go through in order to be healed. Weir's specialty as a director is the exploration of isolated systems (the Amish community in Witness, the boat in the middle of the sea in Master and Commander), and in Fearless he got a real doozy: a mind defining itself in defiant separation from the rest of society. Whatever is going on inside Max's head - and though I say "whatever" as if it were a mystery of some sort, the film's chief genius lies in externalising his internal self so fluidly and easily, without spelling everything out for us in tiny words - what is chiefly important is that it is going on inside his head: he is inscrutable to everyone else in the film, from his anguished wife (Isabella Rossellini), to the therapist (John Turturro) who specialises in post-traumatic stress, to a fellow survivor (Rosie Perez) who lost a child. His interactions with them, Perez's Carla especially, reveal a kind of stricken humanity trying to break free of the incredibly self-assured wall he's erected; but we can see that only because of the incredibly sophisticated movie built around the character. It's really quite daunting to even think about how a movie like Fearless is constructed: everything about it works in such perfect harmony. The cinematography, courtesy of the excellent (if generally undervalued) Allen Daviau seems non-descript at first, until you start to notice the careful manipulation of focal depths to sometimes flatten Max within his world, as when he has run, terrified, out of a lawyer's office, to the top of a tall building; and sometimes to deepen and expand and suggest the profound sense of freedom that Max's new lease on life gives him (my favorite shot in this vein comes early, as Max puts his head out of a car window and enjoys the breeze in his hair; the shallow focus on Bridges's face exaggerates the vagueness of the open horizon). The music, by Maurice Jarre, is something which I don't even feel qualified to speak about: bass-heavy, it never overstates itself (which is a bit of a surprise, for Jarre), but becomes something of a chorus throughout the film, reminding us always of the unexpressed turmoil that Max seems to be successfully ignoring in a manner so subdued, so woven into the film, that you'd hardly notice if you weren't specifically paying attention. Best of all, though, and typical of Weir's films, is the breadth of humanity. Max is our protagonist, and Carla significant enough that Perez got an Oscar nomination, but there isn't a character who isn't fully explored, even in the scantest running time - not even the cartoonishly venal lawyer (Tom Hulce) who just wants to rip the airline apart, truth and justice be damned. One of the finest scenes in the film doesn't even feature Max: it's a group therapy session with several of the other survivors, in which Daviau's conspicuous use of lighting and depth combines with the work of the film's editors (there were three) to create a mini-movie of sorts for a number of people that we've only seen, in snatches, in the background of other scenes once or twice; some of these figures appear in one shot, but the delicacy with which they are presented, both by the actors and by the filmmakers, gives them a reality that kicks us in the gut: every one of them has a full movie that could be told, and it's only chance that Fearless should happen to be about Max. And why not? Max is an excellently-rendered character, giving Bridges a chance to prove all his skills as an actor; taking what is buried in the script and allowing the audience to understand it without being pushy and overt, it's a case study in the indescribably low-key things that the actor always does to express what a character is thinking in the fewest possible movements and steps - but expressing it clearly. For all the genius evident at every level of Fearless, I don't suppose the film could possibly have worked without an actor of Bridges's caliber. The role could easily descend into shallow enigma; Bridges's skill is in the way he expresses the enigma towards the other characters while revealing himself, albeit indirectly and accidentally, to the audience. It's a tightwire performance in a grandly involved character study; exciting for what it reveals of the human condition even as it's artistically a return to the anti-commercial poetics of Weir's earlier Australian films. Small wonder that the crowds who thought of him as "that Dead Poets Society guy" stayed far away; one can only hope that the impending release of the director's first new film in seven years will bring the spotlight back onto this unjustly overlooked masterwork.